Call Now For Emergency Vet Services! Contact Us For Veterinary Surgery! 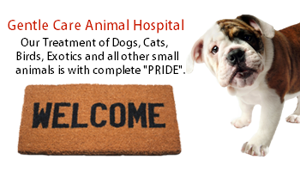 Welcome to Gentle Care Animal Vet! For over 18 years, our mission at Gentle Care Animal Vet, continues to focus on providing exceptional veterinary health care and emergency animal care. We strive to use continual education, the latest industry leading technology and customer service driven veterinary services to ensure that our veterinarian clinic delivers quality and compassionate care to every pet that has been placed in our care. At Gentle Care Animal Vet, we offer pre-approved discounts to any local area rescue group. We ask that you contact us at (405) 509-8058 to see if your rescue group qualifies. Today, taking care of your pet could mean monthly trips to veterinary office to pick up routine medications and prescriptions. That is why Gentle Care Animal Vet, has partners with VetSource to make getting your pet's medications or prescriptions delivered right to your home. Call us today at (405) 509-8058, to learn more about this convenient service. Gentle Care Animal Vet is a full-service veterinary clinic. Our facility includes an in-house pharmacy, lab, radiology facilities, and Intensive Care Unit. Our emergency services are always available during regular business hours, but we do offer emergency vet care, after hours as well. If you require service outside of our availability, please call our office at (405) 509-8058, and you will be directly transferred to the Veterinary Emergency and Critical Care Hospital. I think the world of Dr. Rispoli. Not only does the Doctor and team at Gentle Care Animal Hospital provide the best veterinary care possible, but also unmatched personal service and of course lots of love! I trust you with my most precious possessions...and refer all my friends and family to Gentle Care Animal Hospital. Thanks so much to all of you!-Maya, "Amor & Abrazo"
Copyright © 2018 gentlecareahedmond.com All rights reserved.